Energy Technologies, Inc. (ETI) power site covering hardened, high-reliability global UPS, Power Inverters, Solar Power, Battery Backup, Power Conditioning, Frequency Conversion, Power Distribution, Power Generation and Computer Peripherals that are the Standard used by industrial and telecommunications experts worldwide. Through continuous updating and additions, we expect this site to be educational and informative on the subject of high reliability applications and the associated power conditioning and computer peripheral requirements. MissionCritical™ redundant power systems, hardened computer peripherals and drive expansion units. Each of these products are modular in design and may be modified to suit a particular application or integrated into a total solution. Prime	Contractors: Lockheed Martin, Raytheon, Northrop Grumman, General Dynamics, Boeing, SAIC, Hewlett Packard, Litton, L3 Communications, Telos, BAE, DRS, Lucent and numerous others. Industrial Firms: ABB, Alcatel, Bailey, Bayer, GE Wind Energy, Foxboro, Graybar, Honeywell, Miller Brewing, Solidstate Controls, Texas Instrument, Union Carbide and many others. Extreme UPS are temperature hardened products in service around the country in unconditioned hostile environments. Most commercial UPS and Power Conditioning products are designed for controlled environments as found in computer rooms. The best of these have operating ratings of 0°C to +40°C (32°F to +104°F). However, in uncontrolled environments such as outdoor applications, those competing units typically fail due to temperature. Utilizing our certified environmental test chamber, ETI has designed and qualified the ExtremeUPS line to operating temperatures of -40°C to +65°C (-40°F to +149°F). The ETI0001-1473AA is specifically designed for FAA rack systems providing high reliability, direct replacement for previous 120 VAC power conditioning and power distribution equipment. The ETI0001-1473AA does not require a separate PDU since the PDU functions are already integrated into the power conditioning module. This saves rack space, cabling and expense while improving overall reliability. The unit also has redundant/conditioned DC outputs. TheETI0001-1473AA can be easily upgraded to a UPS with the addition of its companion battery module. The ETI0001-1473A also provides backward compatibility for the 208 VAC version. The ETI0001-1473B version also provides backward compatibility for the 208 VAC version, but without needing the separate transformer module of the older equipment. Most products sold in the hardened market start out as desktop or consumer products (Commercial Off The Shelf otherwise known as COTS). These vendors will attempt to "ruggedize" their product to compete in the hardened market. These ruggedized COTS products usually fail due to either temperature, mechanical shock or vibration requirements since they were not designed to withstand these extremes! ETI's products start out hardened whether for COTS or full MilSpec applications. They are designed to and meet Military Environmental Standards. ETI's products have successfully passed these tests numerous times including Mil STDs 167-1, 810, 901D plus surviving the vehicle mounted endurance tests in the notorious Belgium Block and the explosive charges in the Barge tests. 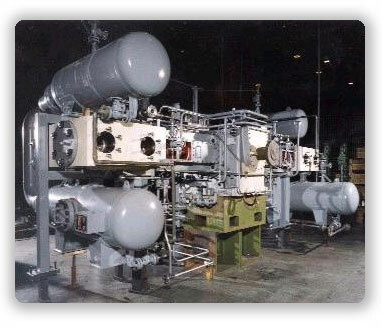 Energy Technologies has been awarded GSA Schedule Contract GS-07F-9485G valid through February, 2012. For more details, refer to the GSA Page on this site. To further simplify procurement, ETI is now set up to accept Government IMPAC Cards, VISA, MasterCard and Discover Card.